Many people becoming concerned about Global Warming/Climate Change may not be aware of the extensive research and practice of weather modification. Many people I have talked to about the Chemtrail issue, struggled at first because they thought that it is not possible to control our weather – this is understandable as this type of research is kept quiet and played down. However, the research into weather control has been going on since time immemorial. Here is a short historical introduction from Wikipedia on weather modification…. ” Magical and religious practices to control the weather are attested in a variety of cultures. In ancient India it is said that yajna or vedic rituals of chanting manthras and offering were performed by rishis to bring sudden bursts of rain fall in rain starved regions. Some American Indians like some Europeans had rituals which they believed could induce rain. The Finnish people, on the other hand, were believed by others to be able to control weather. As a result, Vikings refused to take Finns on their oceangoing raids. (NOTE: Vikings lived in Greenland for 300 years “before” the little ice age 14thC, during a period of global warming- mankind flourishes). Remnants of this superstition lasted into the twentieth century, with some ship crews being reluctant to accept Finnish sailors. The early modern era saw people observe that during battles the firing of cannons and other firearms often initiated precipitation. In Greek mythology, Iphigenia was offered as a human sacrifice to appease the wrath of the goddess Artemis, who had becalmed the Achaean fleet at Aulis at the beginning of the Trojan War. In Homer’s Odyssey, Aeolus, keeper of the winds, bestowed Odysseus and his crew with a gift of the four winds in a bag. However, the sailors opened the bag while Odysseus slept, looking for booty, and as a result were blown off course by the resulting gale. In ancient Rome, the lapis manalis was a sacred stone kept outside the walls of Rome in a temple of Mars. When Rome suffered from drought, the stone was dragged into the city. The Berwick witches of Scotland were found guilty of using black magic to summon storms to murder King James VI of Scotland by seeking to sink the ship upon which he travelled. Scandinavian witches allegedly claimed to sell the wind in bags or magically confined into wooden staves; they sold the bags to seamen who could release them when becalmed. In various towns of Navarre, prayers petitioned Saint Peter to grant rain in time of drought. If the rain was not forthcoming, the statue of St Peter was removed from the church and tossed into a river. 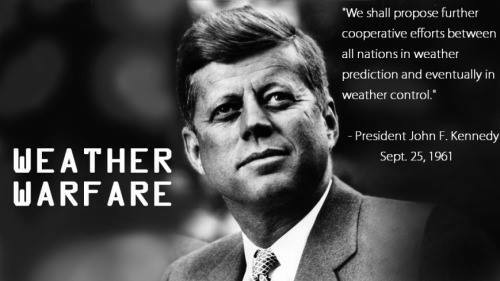 Publically stated by President JFK on the 25th of September 1961 to the UN Assembly that all nations would work together to accurately predict and eventually control the weather.